While thinking about the times I say “good job” to Keener, I realized that I say it most often when Keener has accomplished a common, everyday task — building a block tower, coloring a picture, etc. In these situations, he has not had to persevere or problem solve to accomplish the particular task. He has simply put a few stickers on a sheet of paper or pretended to bake cookies. In the classroom, I found myself frequently responding in this way when students would show me work that I expected them to complete. When we say “good job” in these situations, we are not only doing a disservice to our kids, but we are missing out on an opportunity to provide them with positive, yet constructive feedback. Can you imagine if your boss told you “good job” for turning on your computer each morning? Not only would it become annoying rather quickly, it would also likely decrease your work ethic. When you get frequent praise for accomplishing simple, expected tasks, the desire to work hard can be diminished. We want to be careful that we aren’t doing this to our children by saying “good job” a thousand times a day. By paying attention to our words, not only can we avoid this pitfall, but we can help our children develop confidence, independence, and perseverance through our feedback. Now, instead of saying “good job” after Keener builds a block tower, I try to focus my words on the process and about how it makes him feel. By doing this, it makes it less about me and more about him. 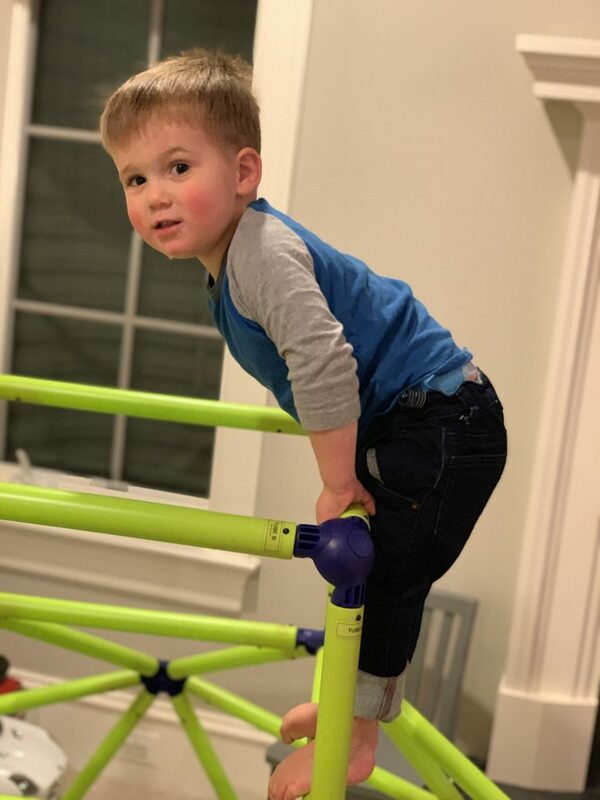 I want him to build a tall tower for his own enjoyment, exploration, and curiosity — not because he gets praise from his mama. I want him to color with crayons to develop creativity and engage in artistic exploration — not because he is always told that his work is beautiful. And I can do this through providing constructive feedback. I made it to the top! How do you feel? Was it scary climbing up so high? Do you feel brave you made it to the top? Look at my tall tower! What do you think may happen to it? I noticed you had to try multiple times to build it; aren’t you glad you stayed with it? I drew a picture! How does drawing make you feel? What do you like to draw? Look at me! I notice you hanging upside down. What is your plan to get down? By responding to his comment with a question or a “noticing comment,” he will start to think about his process. I want him to play, build, and create for his own enjoyment and not for my praise or recognition. While I want to build his confidence, I want to make sure I am choosing the right opportunities in which to do so. And just like a “good job” for turning on your computer would not boost your confidence, I want to make sure that a “good job” for stacking three blocks on top of each other does not hinder Keener’s confidence. By focusing on Keener’s feelings, I am hoping he develops an increased awareness of why he is doing what he is doing, and selects activities that he enjoys for his own fulfillment, not mine. I still catch myself saying “good job” which really has become a habit, one I am trying to break. However, by increasing my awareness and being intentional about my word choice, I have provided Keener with the constructive feedback that he is constantly seeking. Children are little sponges, their neurons rapidly firing and searching for feedback in a constant attempt to learn and make connections. By fostering this, I find that he is happier and therefore better behaved which of course is a win for both Keener and myself. Next week, I will further explore the times we say “good job” — those times when we are truly proud of our kids for sticking with something or accomplishing a difficult task. Being mindful about our praise allows our children to develop the skills they need to persevere through challenges and apply problem solving strategies when faced with hardships. Good Job! J/k I really think this strategy works with children at any age! It could potentially work with spouses or any relationships. Might as well practice this everywhere…how did you feel once you completed this insightful blog? So glad to hear everyone was happier – Enjoyable is definitely the goal! Very helpful, Jenzie. Love your ideas! Gran Dickey going to practice right away! GranJakey is all over this. I too have been a “Good Job” man, now the questions and interactions begin.